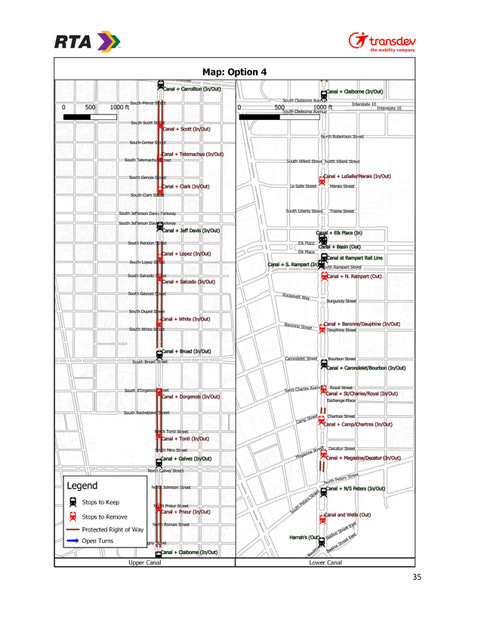 Some 30 stops along the Canal streetcar line would be eliminated under the pilot program. One of the most under-appreciated but unique and valuable aspects of New Orleans is the survival of the street grid. It is what disperses vehicular traffic and minimizes congestion. Too bad, then, that the RTA — the Regional Transit Authority — is exploring options that will chip away at this asset. When traditional American cities were transit-based, street grids were common. Then came Urban Renewal in the 1950s and 1960s, with the closing or elimination of streets and the proliferation of “collector roads” which concentrated vehicular traffic in a few corridors. Nightmare vehicular concentration and newly created congestion were the result. Now, the many “urban renewed” cities with meager remaining downtowns, lots of parking lots and laughable transit are struggling to recreate a street grid, recognizing its value for dispersing development, density and traffic. The wisdom of New Orleans’ surviving street grid is the way it offers drivers multiple opportunities to turn toward specific destinations. The grid spreads out traffic, rather than overloading particular streets and neighborhoods as happens when traffic is shunted into a reduced number of through streets. Further dispersing the load, many New Orleans streets change direction at certain points, making them useless as through-streets and guaranteeing destination-only traffic. Instead, the Interstate 10 and 610 highways attract the heavy traffic (and rush-hour tie-ups). Note, however, that most other cities with an effective surviving grid also have a viable transit system. New Orleans does not. 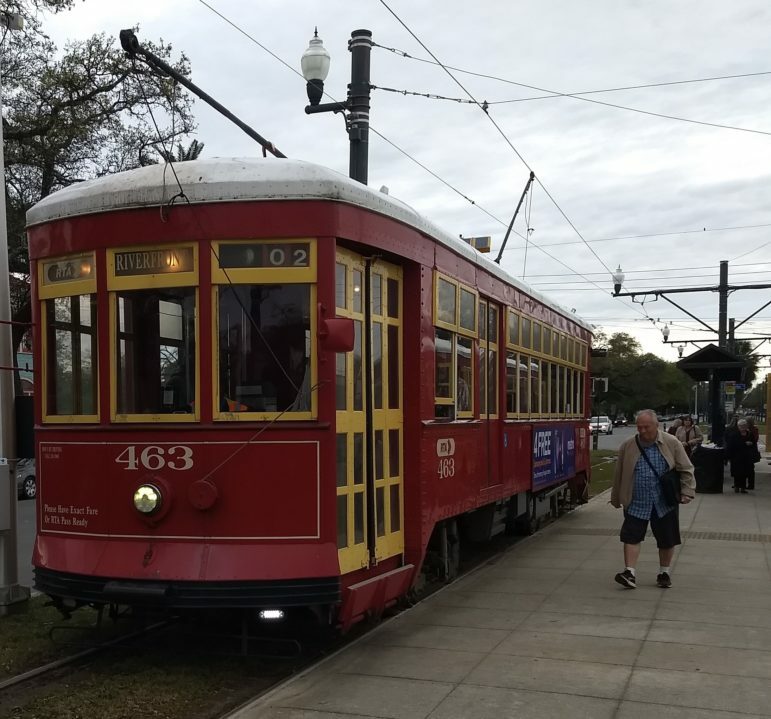 In fact, New Orleans has dramatically decreased transit options over the years, with high-cost investment going into touristy streetcar lines rather than the bus lines that people without cars depend on. Worse yet, a financially-strapped RTA has proposed a seemingly innocuous but quite drastic compromise of the Canal Streetcar in an attempt to save minutes on the full trip. The current proposal for the Canal streetcar is meant to look like a meaningful attempt to address that problem. It fails miserably. RTA calls it a “pilot” program that will last six months, but “pilots” have a way of becoming permanent and spreading to other streetcar lines. Ironically, the author of this proposal is the very company, Transdev, whose contract, already subject to an overhaul, may not be renewed when it expires in August. * The proposal provides good reasons to question Transdev’s leadership and vision. Instead of proposing some very effective options to speed the streetcar without damaging the grid, RTA proposes to eliminate 30 stops and close 17 intersections that cross Canal, using extraordinarily ugly concrete barricades at some of them. And given all the stops slated for elimination, streetcar riders, including the elderly and infirm, will have to walk farther to catch a streetcar. Walking time is expected to double, on average — no fun in the rain or the cold, not to mention in the hot summer months. The map shows which stops would be cut and which intersections blocked. Smart, effective alternatives exist to help speed the time of a streetcar trip. They are already in use in cities across the nation. Among them: gates that swing closed temporarily as a streetcar approaches an intersection; kiosks at stops for time-saving fare paying before boarding; flashing lights warning motorists that “no left turn” is possible as a streetcar approaches. Even the RTA concedes that the flashing lights already in use in a few places on Canal Street and St. Charles Avenue are effective at preventing vehicular interference with streetcars. None of these options compromises the efficiency of the grid. And express buses could provide a speedier alternative to the streetcar. As one measure of its poor planning, RTA has failed to factor in the accelerating pace of development along the Lafitte Greenway in MidCity. That added density may or may not be a good idea, but it certainly will make for additional Canal streetcar riders and vehicular traffic — which will only diminish the time savings RTA is counting on. It is not clear what RTA means when they say in their sweeping Strategic Mobility Plan that they are aiming for “high-capacity transit.” Streetcars (many stops) are not the same as light rail (fewer stops). Portland, Oregon, has both. If RTA wants to turn the former into the latter, this will spell disaster. For New Orleans residents, especially jobholders without cars, the deficit of mass transit is already a problem. The current proposal for the Canal streetcar is meant to look like a meaningful attempt to address that problem. It fails miserably. It is increasingly popular — and appropriate — to be pro-transit and anti-car. But the city needs a more expansive and efficient transit system before it can even think about punishing cars. New Orleans, like it or not, is still a very car-dependent city. RTA’s proposed pilot program solves nothing and creates new problems as it undermines the grid. *This sentence has been edited since it was first posted, to clarify that Transdev can rebid the contract that is expiring.